If you are experiencing chronic pain and limited movement in your shoulder, it’s possible that you may benefit from a total shoulder replacement, an orthopedic procedure that reduces joint pain and stiffness caused by arthritis and other degenerative joint diseases. Although a total shoulder replacement can be a highly effective option for relieving discomfort and restoring freedom of movement to an arthritic shoulder, it’s an advanced procedure that’s not to be taken lightly. This surgery should only be performed by an orthopedic surgeon with years of expertise and experience, such as Dr. Meier in Beverly Hills. In order to make an informed decision regarding your health, it’s important to understand the process and what to expect from this effective orthopedic procedure. Before learning about a total shoulder replacement, it’s important to understand the anatomy of the shoulder itself. The shoulder is comprised of three parts: the upper arm (humerus), the shoulder blade (scapula), and the collarbone (clavicle). 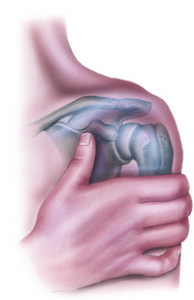 Due to the fact that it’s a ball and socket joint, the shoulder has a tremendous range of motion when healthy. However, individuals who suffer from a degenerative joint disease can experience pain, stiffness, and a decreased range of motion whenever they move their shoulders. A total shoulder replacement (also known as total shoulder arthroplasty) is an orthopedic procedure that replaces worn, rough, and/or damaged joint surfaces with an artificial ball-and-socket joint. This replacement joint allows for smoother movement, better function, and an overall reduction in pain and discomfort. A total shoulder replacement is ideal for those suffering from osteoarthritis or any or other types of severe degenerative joint disease. These diseases erode the cartilage that cushions the shoulder joint, eventually resulting in bones grinding against each other with each movement of the shoulder leading to inflammation and pain. 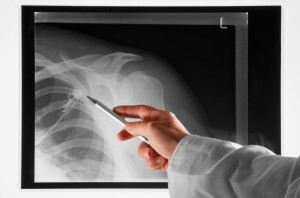 medlineplus.gov has more information on total shoulder replacement. Since surgery should always be a last resort, Dr. Meier will often first try conservative approaches in patients who have not already undergone them. Dr. Meier commonly utilizes minimally-invasive injection therapies that many patients will respond to such as prolotherapy, platelet-rich plasma (PRP) or stem cell therapy. If conservative treatments don’t help with your shoulder pain and Dr. Meier determines that even a partial shoulder replacement will be insufficient, you might be a candidate for total shoulder replacement. During this procedure, Dr. Meier will replace the arthritic ball in the affected shoulder with an artificial substitute. (Also known as the humeral head, the arthritic ball is the rounded part of the humerus that comprises one half of the shoulder joint.) The humeral head will be replaced with a highly polished metal ball that is attached to a stem and is “press fit” into the shaft of the humerus. Depending on the degree of damaged tissue, the stem can also be secured in place either with cement or by impaction grafting the inside of the humerus. This is done via the use of healthy bone tissue which was collected from the removed humeral head. The plastic socket is then attached to the healthy bone socket using a combination of “press fitting” and cement. The benefits of a shoulder joint replacement can be life-changing. Most patients are able to resume their daily activities with less pain and experience functional improvement within just 6-8 weeks after the procedure. Additionally, depending on each patient’s specific needs, this procedure can be performed either in an outpatient setting or in a hospital. Dr. Meier utilizes and innovative regenerative medicine technique for faster recovery: platelet-rich plasma (PRP) therapy. PRP therapy is an innovative, safe, and extremely effective procedure that uses your own blood plasma and growth factors to help support your body’s natural healing process. The result is a faster recovery with lower chances of complications. Who is a Candidate for a Total Shoulder Replacement? If you suffer from chronic shoulder pain, a total shoulder replacement may be the best treatment to bring you the relief you need. Beverly Hills orthopedic surgeon Steven W. Meier, M.D. and his team at Meier Orthopedic Sports and Regenerative Medicine are experts in joint replacements and regenerative techniques. Let us provide you with the best long-term outcomes for your condition. Contact our orthopedic experts to schedule a consultation in our Beverly Hills facility today!